The Italian international - turned manager, Roberto Mancini, is back at Inter Milan for the second time, after a very successful first spell, between 2004 and 2008, when the club won three consecutive Serie A titles and two Coppa Italias. Upon the departure of Walter Mazzarri, who exited on Friday after 17 months in charge, Mancini (49) signed a 2.5 year deal with Internazionale, valid until June of 2017. The 18 times Serie A winners, Nerazzurri, are not in such hot form these days. Inter are 9th in the Italian league tables, twelve points behind first place Juventus and five points behind 3rd place Napoli. They have four wins in eleven matches. The club does not have much transfer market spending room either, as they are already past the UEFA Financial Fair Play limit. Getting into the Champions League, likely with the team at hand and as soon as possible, is the goal for Roberto Mancini this time around. To try and put Inter back among the European elite. Last time Inter did well under Mancini, the team lineup was quite serious: Zlatan Ibrahimovic, Francesco Toldo, Dejan Stankovic, Walter Samuel etc. The star talent today are Mateo Kovacic, Hernanes, Icardi and the goalkeeper Samir Handanovic. I wonder how many of the new names would make the starting XI back then. The first game in charge for Mancini is the next weekend's Derby della Madonnina, away to city rivals AC Milan, followed by a visit to AS Roma the weekend after. Inter also play a mid-week Europa League game vs. Dnipro. Inter are doing well in the Europa League so far this season. They are undefeated and first in their group. Hiring Mancini is a really good move by Inter Milan it feels like. Can the club reignite the old flame? It would be nice to see Inter back in the mix! Mancini will be presented at 2pm on Saturday, November 15th, 2014. The first time around, Mancini was sacked for being fairly unsuccessful in the UEFA Champions League. Jose Mourinho took over in 2008 and the club won the tournament a year later. Juventus were relegated to Serie B when Inter won the title under Mancini in the 2006/07 season. AC Milan also had a 8 point deduction after the infamous Calciopoli scandal. Mancini's next stop after Inter was Manchester City, where he won a Premier League title and the FA Cup. During the short spell at Galatasaray, he won the Turkish Cup last May. 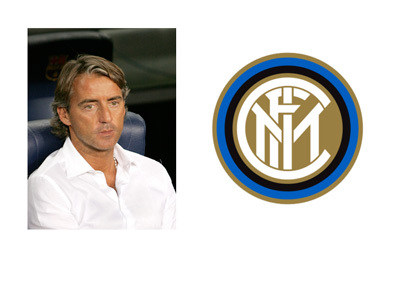 Forza Inter and Roberto Mancini!